No matter what area of your life you’re trying to improve there needs to be a sharp focus on breaking bad habits and forming good ones. 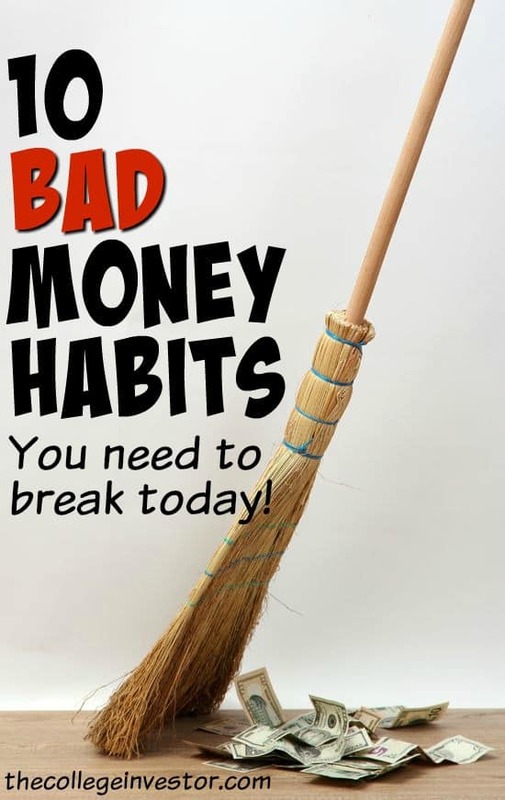 If you currently possess any of the bad money habits below you need to work on replacing them with positive habits that will move you closer to your financial goals. Spending more than you earn is THE cardinal sin of personal finance. This one habit will have a trickle-down effect, causing big problems in all areas of your personal finances. For instance, if you spend more than you earn you’ll have to rely on credit to cover the rest. The credit comes with interest and traps you into debt. You continue spending more than you earn creating a bigger, more vicious cycle. If you currently spend more than you earn this needs to be the very first thing you address. Don’t even worry about anything else until you’re living within your means. You can really do two things here. You can cut your spending and budget better, or you can focus on earning more money to close the gap. ** As a side note, this also include tax refund anticipation loans. If you currently take out payday loans you need to break this habit now. The interest is not worth it. There are SO many other ways for you to come up with money when you need it. If there’s one thing you can count on it’s that at some point or another something will go wrong. An accident will happen, a job will be lost or an appliance will break. Being prepared for an emergency is very important when it comes to your finances. You don’t want to be caught off guard, financially anyway. Save up some cash for emergencies. Related: Emergency Funds: How Much Do You Really Need? Paying your bills late – it’s a bad habit to have but happens to even the best of us. When you pay your bills late your credit score takes a hit and you could cost yourself more money in late fees and interest charges. Make it a habit of always paying your bills on time. If you’re the type of person who simply procrastinates with tasks like this consider enrolling in auto-pay. It also means you probably need to get financially organized. Check out this guide on how to organize your finances so that you don’t miss another bill again! Sayings like #YOLO and #FOMO can make you feel like you need to spend all of your money and spend it now. Why save for the future instead of living for now, right? Wrong. When it comes to money there needs to be balance. Shouting YOLO at the top of your lungs won’t magically make you have a great life in retirement or help you build wealth. Enjoy life now but also be sure to save for the future and diligently work towards your goals. If you find yourself working a soul-sucking job that you hate, or not being able to find a job at all, you need to take responsibility and take charge of your career. While it might seem scary to go down a new path, start a side business and put yourself out there, it’s all in your hands. You can take charge of your career – nobody else is going to do it for you. Taking control of your career and negotiating your salary is one of the best ways to boost your income. If you fail to do this, you could be costing yourself over $100,000 during your lifetime! “Life isn’t fair.” It’s a phrase we’ve all heard before and one we’ve likely said to ourselves. And it’s completely, 100% true. We’ve all been born into different circumstances, some of us having many more opportunities than others. While “life isn’t fair” is true, blaming other people isn’t going to help you – at all! Accept where you’re at and play the cards you’ve been given. Only compare yourself to yourself. On the opposite end of going into debt and spending too much is being afraid to spend anything! If you’ve been hoarding money to the point of misery it’s time to break that habit. Lighten up on yourself a bit and enjoy the money you’ve worked hard for. Don’t let excuses hold you back. You have the choice to work hard and build the life (and finances) you want or to make excuses. Choose wisely. 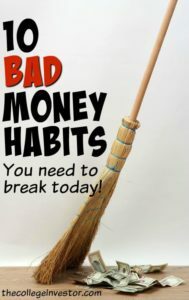 When it comes to breaking bad money habits, it can sometimes be easier to replace those bad habits with new, good ones. Just take it down to the basics – live within your means, avoid consumer debt and save for the future. If you can accomplish those three things you’ll be in a good place. Are there any other bad habits you’d add to this list? A while back, living paycheck to paycheck made it impossible to save for any emergency. However, as bad luck would have it, I woke up one day with a terrible toothache and found out the same day I needed surgery (and had to scrape the money together to pay for it). I didn’t know what hurt more, my tooth or my budget! It was a terrible experience, but a very valuable money lesson.